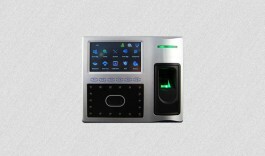 Face 902 is multi-biometric terminal for access control and time attendance management, based on facial, RFID, fingerprint and PIN identification. Integration of Fingerprint, Facial, RFID and Password identification methods. 4.3" 65k color TFT screen, easy operation, fashionable and simple interface. Simple access control function reduces extra door control equipments cost for users. Webserver management software via IE browser. Infrared optical system enables user identification in dark environment.